Popular Ranch home designs, inspired by Spanish-American homes in the Southwest, date back to the 19th century. After World War II, the popularity of Ranch style architecture exploded, expanding to every corner of the nation. With the advent of the Federal Housing Authority and the 30-year mortgage, more people were becoming homeowners. With the rising cost of labor and materials, the demand for affordable housing was at an all-time high, making single story style houses a great bargain. Today any one-story house design can be defined as a Ranch, however true Ranch home designs are simple, low to the ground and one room in depth. Our collection features beautiful Ranch house designs with detailed floor plans to help you visualize the perfect one story home for you. We have a large selection that includes raised ranch house plans, so you are sure to find a home to fit your style and needs. 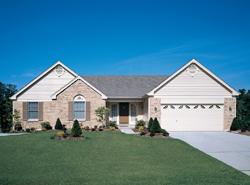 Check out House Plans and More for our diverse selection of ranch house plans.